How is a wedding dress like a casket? Well, I don’t know. And it doesn’t really matter. This is the question that was posed to me today at work. Let me explain. You see, we recently switched casket companies so today there was a meeting where we studied our merchandise. My boss had asked me how I explain our caskets to our families and after pondering the question I can up with this answer. Not well. You see, being as young as I am I am unfortunately hindered by one little detail. Life experience. I simply do not have much. Not as much as Mark, our other funeral director, has. You see he has sold merchandise before (not caskets), but still. He has a couple of more years of experience talking with people and learning how to listen to what they are looking for. A trait that I am currently lacking in. But you see, I did work in a Bridal Salon for a short amount of time before I got the job at Lakeside Memorial Funeral Home. And I sold wedding gowns. And I sold a lot of wedding gowns. I was quite good at it, if I’m being honest. Now I know what you’re thinking. “Lauren, that’s a completely different scenario. That’s the happiest day of your life compared to the saddest day of your life.” That’s what I was thinking, too. But if I can sell a wedding dress why couldn’t I sell a casket? In today’s day and age everyone lives everywhere. People move away. It happens. Families don’t really get together unless it’s for two events; weddings and funerals. Now, besides for the emotional aspect lets take a look at this. At a wedding, all eyes are on the bride and her gown. At a funeral, all eyes are on the deceased and “how dead they look”. Basically, does this deceased person look like wax or do they look like they’re sleeping? That, and the casket that they are in. Now, I understand that all of you reading this aren’t exactly like me. When I go into a new funeral home my eyes are darting everywhere. How big are their visitation rooms? How did they set up the flowers? Do they have any people greeting in the hallway? And yes, what does the casket look like? But think of this as well, if you’ve ever been to a funeral home where the deceased was laid out in a really beautiful casket, you notice. Whether is be a beautiful oak casket or a stunning stainless steel casket, it stands out. And sure, you have to pay for a certain look. But this always gets me. A woman will spend a couple thousand dollars on one dress that she will wear for one night, however people cringe when they are asked to spend a couple of thousand dollars for a casket in which their loved one, well quite frankly, will spend the rest of their nights in. It doesn’t make sense to me. 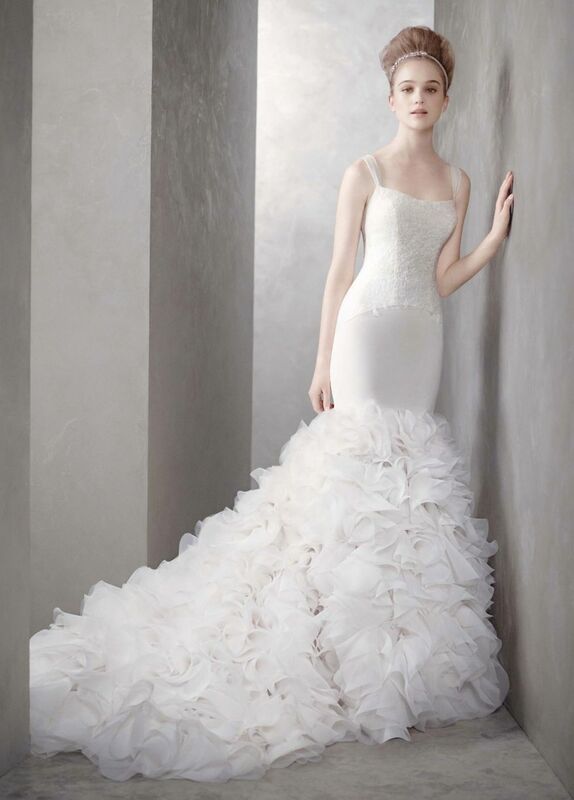 You can buy this beautiful Vera Wang wedding gown for only $1,498.00! TO WEAR FOR ONE NIGHT. Again, You will put on this gown for ONE night…am I hitting home yet? So, I have decided that a wedding dress and a casket are exactly the same. Both are meant to show off the person to whom they are designated. Both should portray the style of that person. Both should look like they are made for that person. You will no doubt have photographs of your loved ones in their dresses during their wedding day. Do yourself a favor. Choose a final resting place that will show honor and respect to your loved one. Contrary to popular belief, you don’t need to take out a second mortgage for most caskets. You can choose one that fits your loved one in your budget. It’s a final memory picture that you’ll have of your deceased, after all. So don’t dismiss the importance of your decision. And if you ever find out how a raven and a writing desk are similar, let me know. Lauren..never quite looked at the casket as an extension of the person inside……sooo as a christian I am part of th Bride of Christ and I have never owned a bridal gown…so dress me up as a bride for my Lord at the day I am looking forward to with Joy…..keep up the marvelous work girl..you are an inspiration in ways you are not aware of………God Bless you honey! Me, being bored, searched the question on Google. I found two answers!